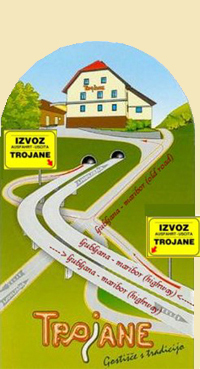 In different historical periods, Trojane was always an important spot for ancient travellers on the road from the middle to the eastern part of Slovenia (looking at the borders as they are today). Ancient Romans who travelled from Emona (today's Ljubljana) to Celeia (today's Celje) and onwards to Petovia (today's Ptuj) established their army and post office there. They named it Atrans. The oldest known written record mentioning the present name of the place goes back to 1229. Coins with the images of Roman emperors` (Comodus, Domitian, Hadrian) are a small part of the rich archaeological findings in Trojane. At the time of the Austro-Hungarian monarchy, before the railway line Vienna - Zidani most - Ljubljana - Trieste was built, there was a well-used road. The road was named the "Old Vienna road" by the native people and it connected Celje via Trojane and �rni graben with Ljubljana and Trieste. Along that road, locals built a great number of two-storey carter houses, relatively large for that period, with a tavern on the ground floor, accommodation above, big stables for horses and warehouses for storage. Old written records from 1826 tell us that the owner of the majority of such carter buildings around Trojane was Toma� Kotnik (an ancestor of the Konj�ek family). Among all the buildings in Trojane which still serve their original purpose today, there is one, proudly showing its construction year which goes back to 1849. 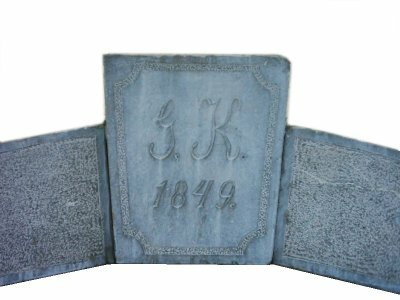 The year is engraved in a stone plate and fixed above the main entrance. The building belongs in the treasury of national immovable heritage and has been placed under monument protection. Credit for such classification of this impressive building goes to the first members of the Konj�ek family. In the years between 1911 and 1913, the landlords formed a union, organised as a shareholders' company, and invested in the purchase of three buses (Zaurer brand) from Vienna in 1913. Among the shareholders was Franci Konj�ek, father of Gregor Konj�ek. In the same year, the first two buses began carrying passengers to Trojane. The company bought the buses to establish a connection between Ljubljana and Celje. One bus ran from Ljubljana to Celje, the other went from Celje to Ljubljana. Both buses met at Konj�ek`s in Trojane at 8-a.m. and continued their way after a short stop for refreshment and a snack for the passengers. In the afternoon, both buses returned. The third bus was just a reserve in case of problems with the other two. It is interesting to note that the bus journey on the macadam road between Ljubljana and Celje took three hours. The first two buses came to Trojane in the year 1913. 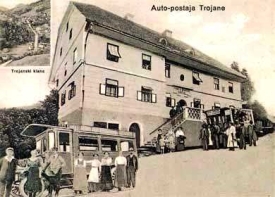 In 1939, a boarding house was built in Trojane - the Konj�ek hostel. Beside the hostel there was also a petrol station for the buses and infrequent cars. After World War II the People's Republic of Yugoslavia accomplished the nationalisation of all private properties. No one was spared, not even the Konj�ek family. 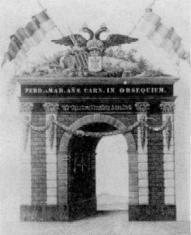 They had to incorporate all their properties into the Trojane Agricultural Co-operative, just like other local farmers. In July 1959, the co-operative opened the restaurant "pri Kon�ku" and revived activity in Trojane. Rajka Konj�ek was in charge. At the beginning, there was only one employee working in the restaurant. The traffic became heavier and tourism began to develop, so the Trojane restaurant, with its special position, expanded quickly. In 1959, the road was finally tarmaced. Accommodation called 'rooms for foreigners' was built in 1959-60. By that time, there were 18 people working for the company. In October 1960, the catering industry was separated from the co-operative and began to work independently. That year was a special landmark in the company's history, as it is was considered to be the year of establishment of the company as it is today. Soon after, in 1961, the company started to produce the famous dessert 'Trojanski krof ' (Trojane doughnut), well known in Slovenia and most of Europe, just occasionally at first, but since 1962 on a regular basis. Finally, here is a short summary of the events in the last decade of the 20th century, which were important for the company. In 1992-93 the company's administration successfully accomplished negotiations on the denationalised property of the Konj�ek family. To the satisfaction of both sides, they agreed on a settlement and a pay-off . In 1994-96, the right of ownership was settled, and in September 1996 the company was registered as a shareholders' company.